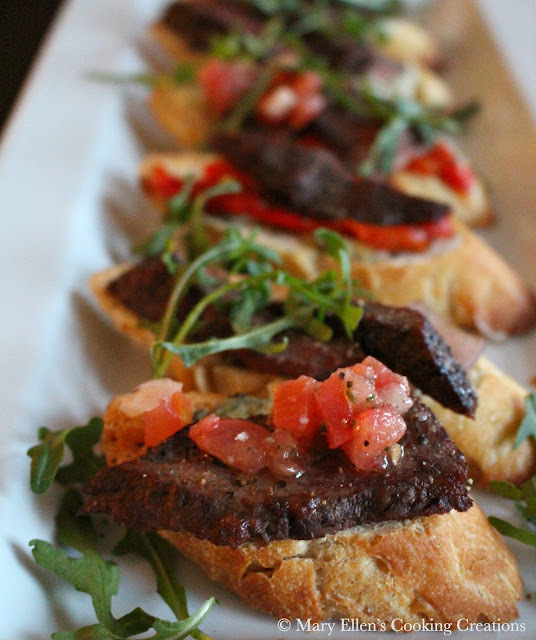 An elegant appetizer for entertaining - crusty, toasted bread topped with creamy melted cheese and thinly sliced grilled flank steak. Our friends were in town on business recently so we were lucky to spend a fun night with them over good food and of course, lots of good wine. We definitely don't get to see them enough so this midweek visit was a special treat. As soon as the visit was planned I started to discuss the menu with my friend Jeff who shares my love of food and cooking. My husband tried to contribute (I'm lucky he loves to cook, too! ), but whenever Jeff visits the food is always our thing. I knew our menu would include several courses. We ended up with three appetizer courses an an entree. Honestly, but the time we were done with apps I didn't even need an entree, but after an hour break we got back to cooking. 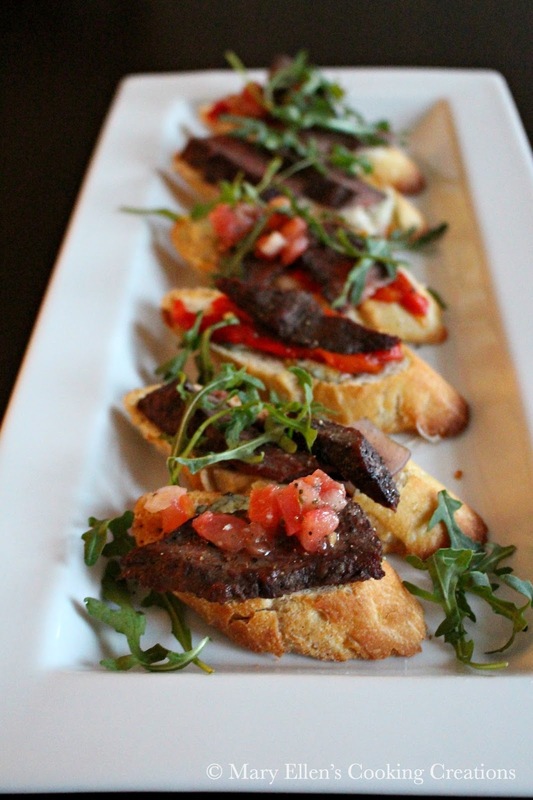 Our favorite appetizer was this grilled flank steak crostini. I love crostini with different toppings, so for this one we decided on melted cheese and thinly sliced grilled flank steak. From there I just winged it and made several kinds of crostini with different toppings. 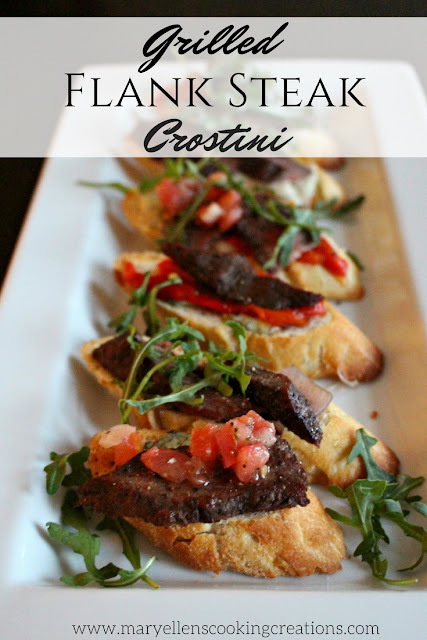 Half of the crostini had melted provolone and steak, while the other half were topped with blue cheese and the steak. Toppings I used were chopped grilled red onions and sliced roasted red peppers. 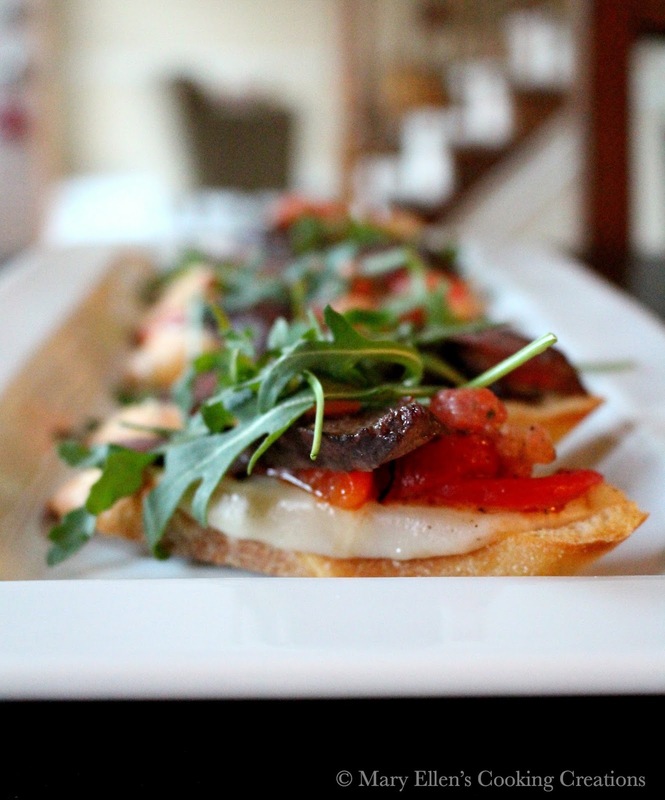 Once the crostini came out of the oven I topped some of them with cold tomato bruschetta topping and fresh arugula. I can't even pick which combination of ingredients were my favorite - they were all good!! They were so good that the next night my husband and I made more for dinner with the few leftovers that we had, and I plan on making them for a girls' night I am hosting next week (as long as the blizzard doesn't mess up my grilling plans!!). Yes, THAT good! Heat grill to high. Season flank steak liberally with salt, pepper and dried thyme. Cook __ min per side, flipping only once, to medium rare (or medium, depending on your liking). Let rest 10 minutes before slicing into very thin slices. In the meantime, heat your oven to 400 degrees. Place the baguette slices on a cookie sheet and brush with olive oil. Put in the oven for 5-7 minutes, until crispy. Remove from the oven and rub each baguette with the raw garlic. Top each baguette with cheese, steak, and other toppings, except the arugula (optional: put some more cheese on top). Return to the oven and turn your broiler on high for 2 minutes or until the cheese has melted. NOTE: if you don't want your steak to cook any more under the broiler, only top the baguettes with cheese and other toppings and broil. Top with the steak after removing from the oven. Optional: top with some fresh arugula and drizzle with olive oil before serving.